Williams has been used as a pinch runner two of the last three games but hasn't been to the plate since striking out in a pinch-hit appearance Sept. 18. 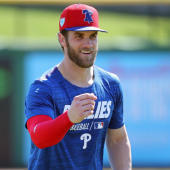 The 25-year-old is dealing with shoulder and hand injuries, and although the severity remains unclear, his usage as a pinch runner suggests it's not an overly serious issue. Williams is likely to finish the season with a .256/.324/.425 slash line with 17 home runs in 407 at-bats.